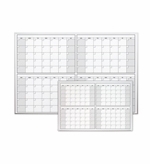 4 Month dry erase calendars allow you to track plans and events for 4 months at a time. The board is divided up into 4 equal month sections. The boards are all made with our own Opti-Print™ white board graphics which means that the design is embedded beneath one of the best dry erase surfaces available. And since the design is under the dry erase surface and not on top of it, the surface is smooth and easy to write on and erase, and the graphics will never fade or peel off. Want something different or would like to include your company logo? 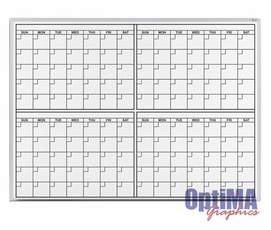 Customizing your dry erase calendar is both easy and inexpensive. Simply pay a one time artwork fee and we'll make your board. Order additional boards with the same design and there are no additional charges! From "Size" "203: 24\" Tall x 36\" W (+$99.95)" "304: 32\" Tall x 45.5\" W (+$199.95)" "404: 4' Tall x 4' W (+$275.00)" "406: 4' Tall x 6' W (+$375.00)" "408: 4' Tall x 8' W (+$475.00)"